It's finally happened. 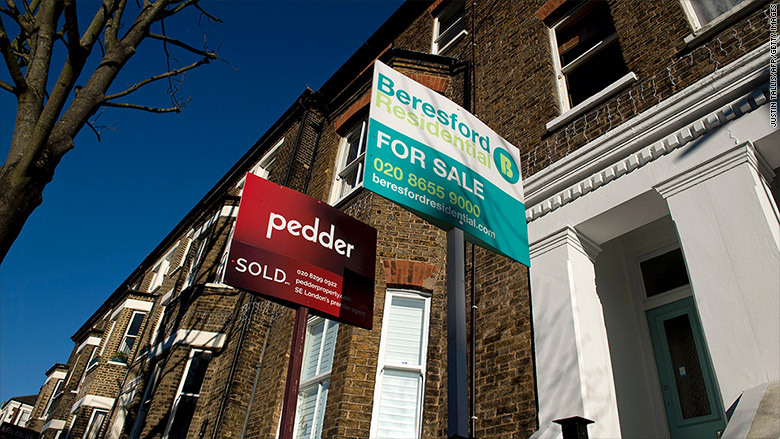 London property prices have fallen after years of runaway increases. London home prices slipped 0.6% in the quarter ended September, according to Nationwide. It's the first decline since the financial crisis. The mortgage provider said the average sale price for a London home is £472,000 ($630,000), an increase of 56% from a decade ago and more than double the current national average. Nationwide said that mounting pressure on household incomes was weighing on confidence and contributing to the slump. Experts have warned for over a year that Britain's planned departure from the European Union would hurt London's supercharged real estate market. The worry is that major shifts in law-making, immigration, investment and trade could scare away buyers -- especially wealthy foreigners. The doomsday scenario envisioned by some observers has failed to materialize, with initial price declines being limited to central neighborhoods that had been especially frothy. Prices in other areas of the city proved more robust, with sales being supported by ultra-low interest rates, a robust job market and government programs designed to encourage purchases. But continued uncertainty over Brexit and the U.K.'s future trading relationship appears to have taken its toll. "Low affordability, the economic slowdown and uncertainty about the U.K.'s relationship to the EU are keeping demand in check," UBS analysts said this week. "We continue to advise caution given high market valuations and enormous political uncertainty." More pain could be coming: The Bank of England has strongly hinted in recent weeks that it will raise interest rates, making mortgages more expensive. Home prices in London slipped 0.6% in the third quarter compared to last year, according to Nationwide. Many analysts, however, are optimistic that price hikes will resume after Britain's divorce from the EU is complete. Savills predicted this week that the most desirable London neighborhoods could see prices rise 20% by 2022. "When uncertainty clears and central London's prime residential real estate again represents identifiably good value, prices will bounce, though not to the same extent as in previous cycles," it said.